I’ve got quite a treat for you today! Besides the Australian Federal Solar Incentives and Australian State Feed-In-Tariffs, Australian government also provided other forms of encouragement for solar/renewable energy projects. In 2008, Premier Mike Rann announced the $8 million investment in the largest rooftop solar installation to take place at The Royal Adelaide Showground (locally known as the Wayville Showground). The Showground is located in the inner-southern Adelaide suburb of Wayville, just south of Greenhill Road. It is bordered by Goodwood Road (east), Leader Street (south), the railway line (west) and Rose Terrace (north). The Royal Agricultural and Horticultural Society of South Australia (RAHS) has controlled the site since the 1920s, the land having been purchased by the South Australian government prior to the First World War. 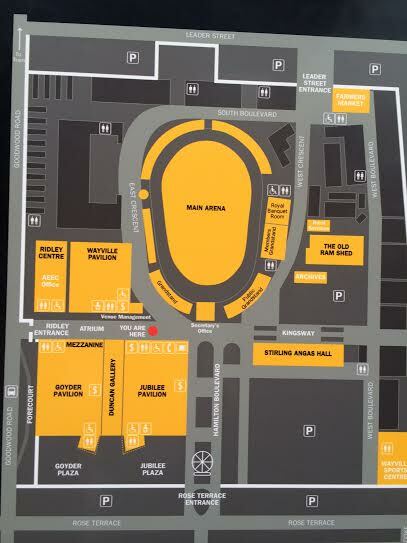 The Royal Adelaide Showground moved to the present site in 1925. The Adelaide Showground has one of the largest under-cover exhibition spaces in the Southern Hemisphere, hosting over 140 exhibitions and conferences, attracting over 1.3 million visitors each year. From its 3.5 million liter underground water tanks to its solar installation generating 1,400 megawatt hour of solar electricity each year (equivalent to the capacity of powering 250 South Australian homes, powering 40% of the total average annual Showground’s power needs, saving 1,400 tonnes of greenhouse gas emission annually), Adelaide Showground is arguably the most environmentally friendly multi-purpose venue in Australia. 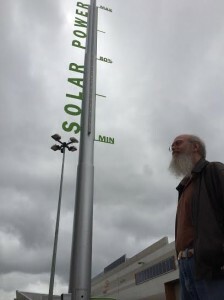 It also provides a valuable educational resource for the wider community (check out its Solar Power Meter below, rarely seen at any other solar rooftop installations). that I have never seen at any other solar installation sites. 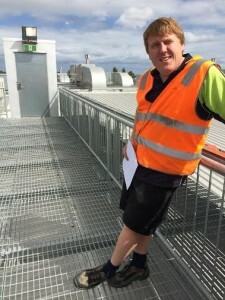 It is easy to see the pride of the local people in their Royal Adelaide Showground solar rooftop through the eyes of Mr. Ross Hocking. 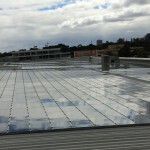 The project is the first MW-scale industrial rooftop solar plant in Australia and the first commercial installation of First Solar Cd-Te thin film technology. The total area of the panels is 9,239 square-meters, installed on six buildings: Goyder, Jubilee, Wayville, Dairy/Goat Pavilions, Duncan Gallery, and Ridley Center. 12,612 First Solar 77.5 watt thin film CdTe modules, manufactured in Malaysia, and 108 Suntech 210 watt polycrystalline Si modules, manufactured in China, were installed on northern facades, Jubilee and Goyder Pavilions and screens. It took just three months to complete. The system is divided into 184 sub-systems, each is monitored for power production. The thin film technology chosen for this project has better temperature tolerance than typical mono- or poly- crystalline panels. These panels are warrantied for 25 years, but are expected to last at least 30-40 years. Its estimated average 1,400 annual power production will generate a gross saving of approximately $126,000 pa. Furthermore, as an Accredited Power Station, Renewable Energy Credits (REC’s) are received for MW’s generated, estimated at about $46,000 (traded at market value). 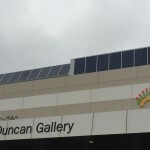 Installation of the solar panels and associated systems was managed by building and engineering company Built Environs in partnership with grid-connect solar systems provider Solar Shop Australia. Usually the panels are washed once a year. 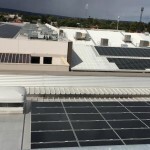 Maintenance was contracted for the first ten years by the systems integrators, Solar Shop Australia Pty Ltd, to ensure the correct functioning of all structural and electrical components. Once again, we see the importance of effective government policy and/or actions that would benefit both the consumers and growth of solar energy industry, insuring local economic prosperity while solving a nation’s concern for energy security and environmental quality. Australian government and politicians have accomplished a great deal. Bravo! This entry was posted on Wednesday, March 26th, 2014 at 8:51 AM	and is filed under Educational, News. You can follow any responses to this entry through the RSS 2.0 feed. You can leave a response, or trackback from your own site.